Summary: The circus arrives without warning. No announcements precede it. It is simply there, when yesterday it was not. Within the black-and-white striped canvas tents is an utterly unique experience full of breathtaking amazements. It is called Le Cirque des Rêves, and it is only open at night. 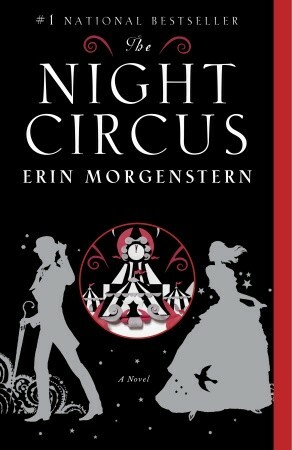 My book club decided to read THE NIGHT CIRCUS by Erin Morgenstern as our February pick. I was extremely excited since I've had this book on my shelf for some time now (I won it from Jenn's Bookshelves!) and had never gotten around to reading it. I had heard that it's a beautiful novel, and while it's not exactly my normal reading fare, I thought it sounded intriguing. For those of you who have been living under a rock(! ), THE NIGHT CIRCUS tells the story of Le Cirque des Reves, a traveling circus that "magically" appears and opens only at night. There are some traditional circus acts, and some not so traditional ones; and the entire circus is decorated in black and white -- absolutely no color. While this circus is the basis for this novel, the story really delves into the special relationship between Celia and Marco, two magicians who have been training their whole lives for a competition against each other. They are given little details about this game-- and definitely not the important one that only one will be left standing; and they aren't quite sure what their role is. When they find themselves falling in love with each other, the game takes on a different meaning; and their actions end up having consequences for not only themselves but everyone involved in the "night circus." I liked THE NIGHT CIRCUS a great deal, and there were even quite a few times when I thought I loved this novel. There is no doubt that it's an extremely well written piece of literature and unlike anything I've ever read. I will admit that I absolutely treasured the first half of this novel -- how the author brought the characters and the setting to life as well as how she told this story; however, I found that I was wanted a little more plot as the story went on. Having said that, the longer I've let this book stew in my thoughts, I've grown to appreciate it more and more -- and I liked how magical the story was! I don't think I can do justice to explaining how amazing Ms. Morgenstern's writing skills are. Truly, this is one of those novels that you need to experience for yourself. The book's description barely touches the surface of everything this book encompasses, and I am still shaking my head at how the various story lines all came together at the end. There were lots of characters, both members of the circus as well as fans, and I never had an issue keeping them straight. In addition, the story was told in a non-linear format which could have been confusing, yet all of it just meshed perfectly into a beautiful tale. Unfortunately, I wasn't able to attend this month's book club meeting to discuss the book and see what all of my friends thought -- both of my kids were suffering from the flu and my husband was out of town; however, I did hear that everyone liked the book quite a bit. Beyond that, I have no idea what we discussed! I'm pretty sure we used this reading guide to get started. These twenty questions are complex and require some deep thought and I bet the discussion was fascinating! Some of the topics that you might want to explore further include the concept of dreams, morals/ethics, deception, love, competition and much more. There is also a great deal of symbolism to analyze including some Shakespeare references, the bonfire, and the concept of time to name just a few. Overall, I found THE NIGHT CIRCUS to be a beautifully written story that transported me to a magical place and time. Highly recommended. Okay. It's official. I really am the only person left on earth who hasn't read this. I'm definitely going to try to make time once my busy season is over. No Candace, I haven't read it either! Ha! I DO have the book but when it first came out there were two million reviews and I figured the world didn't really want one more. So I am letting it age a bit first. I will read it some day. I've checked this book out from the library twice and still haven't read it! The first time I ran out of time to read it and the second time I just couldn't get into it. Plus, like Sandy said, the blogs were saturated with this book and I didn't want to let lost in the flood. lol But I will get back to it one day, for sure. Bummer that you had to miss Book Club where this was discussed. I actually missed the blog-saturation period (must have been during my hiatus) so not only have I not read it, I'd never even heard of it. Thanks for putting it on my radar. I'm another one who hasn't read this one yet. I have to admit that I'm afraid of the fantasy aspect of the story. If you liked it, maybe I should give it a try. I loved this book. Lovely review! I really enjoyed this book even if it was lacking on character development and plot because the writing was so fantastic! This is one of my bookclub choices for this year too, and it will be very interesting to hear what the ladies think of it because it is not their normal type of read at all! It will also give me a chance to reread it I think! I suspect that I inhaled it so quickly the first time through that I need a reread to see what I missed! I loved this book too. The owner of my local indie book store feels strongly that Erin Morgenstern is the next JK Rowling.